On such a cold blustery day thought I would remind everyone it is still spring. Flowers are blooming now everywhere you look. I took those photos on a much warmer day about a week ago. The first one is familiar but often overlooked. Take a second to think where you've seen it before. These beautiful purple flowers are on Creeping Charlie a.k.a. Gill -over-the-ground, Ground ivy, Ale hoof and more. The scientific name is Glechoma hederacea and it is a member of the mint family. It makes a nice tea. Those who desire a perfect green monocrop of grass in their yards tend to hate creeping charlie but it is a wonderful little flowering plant that grows in many areas that are not optimal for grass. 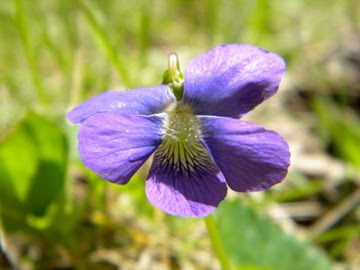 Nest up is the common violet. Another flower that loves my yard and I have no problem with that. These are beautiful spring flowers. 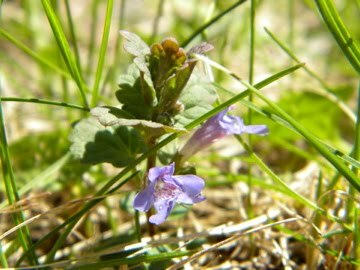 Unlike creeping charlie, Viola sororia is native to the United States. I'll think I'll finish things off with the much maligned Dandelion. When I was a kid I assumed the name was simply Dandy-lion. The yellow flower looks a bit like the golden mane of a lion. Apparently though, the name comes from the leaves not the flower. The common name comes from the French "dent de lion" or literally "teeth of the lion" and refers to the shape of the leaves, not the flower. This version of "creeping charlie" resembles the smaller Hawaiian mints. I was a bit shocked when I first noticed a patch of it in Minnesota, looking so much like the stenogyne calaminthoides I see everywhere here.